I thought I'd include this story about a UFO over Canterbury (New Zealand) mainly because it's close to home and it's such a great photo. There doesn't seem to be much genuine UFO appeal - according to Alan Gilmore of Mount John Observatory, it appears at first glance to be a plane. 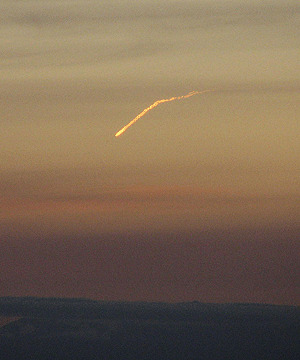 That's how I see it too - maybe a vapour trail lit by the setting sun. Still, awesome photo.